You have probably heard about them. The wheel chocks. If you ask your RV salesmen what you need to buy before leaving the lot, he or she will give you a list of things, but wheel chocks will be one of the most important purchases for the safety of you, your RV, 5th wheel, or any trailer, and people around you. How come? Well, imagine parking your trailer, and the first thing you do before unhitching is present an uphill to the tires. Even if you’re parked on a flat surface, you will give the tires an obstacle that they shouldn’t be able to go over. Stop that tire from doing its job, rolling. This will not only prevent the damage that would occur if your trailer started rolling while unhitching but the life-threatening injuries that could happen to you if you’re underneath the trailer working on maintenance when it takes off. Just take a look at this guy working on his truck when it decided to roll (beware, scary video, but he is ok). So today we will be talking about wheel chocks and some of the different products that are on the market today. I will also write about some stabilizing tips to make the trailer more stable when parked. Camco is a company that I think most campers have heard of. The reason being that they make a lot of different camping and RV gear for a price that is hard to beat. It’s like the IKEA of RV accessories. Of course, they also make wheel chocks. You can buy them either with or without a rope; I recommend the rope because I have a pair without them and they’re awkward to carry around. Of course, you can also add your own rope to the ones without it. The Camco Wheel Chock With Rope Handle are good for tires up to 26″, remember that we want them to cover at least 25% of the height of the tire. What makes them so different from the other products in this comparison is the weight. They’re more than half the weight of the competition I am comparing it to. Why? Because it’s made out of plastic. Camco advertises it as being made out of durable hard plastic with UV inhibitors though, so durability might not be an issue. A good start for somebody with a smaller trailer, for heavier trailers I recommend wheel chocks made out of rubber. 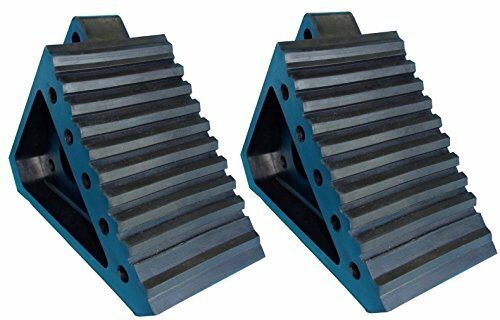 If you’re looking for heavy duty wheel chocks, look no further. 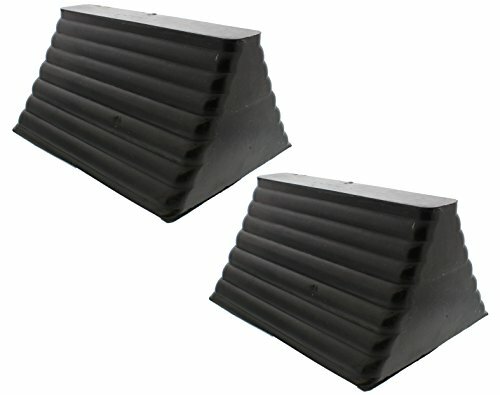 Weighing in at 12.2 lbs per wheel chock, these will be the most robust choice to stop your trailer from rolling. A metal handle makes it easy to carry this beast of a wheel chock, and the laminated rubber will help to stop the chock from slipping and tearing. The one of the bunch that will take the biggest beating from the weather without showing it. Note that this wheel chock does not come in a pair. If you buy it, you will get one single wheel chock. And remember to check the measurements on these, they’re huge! 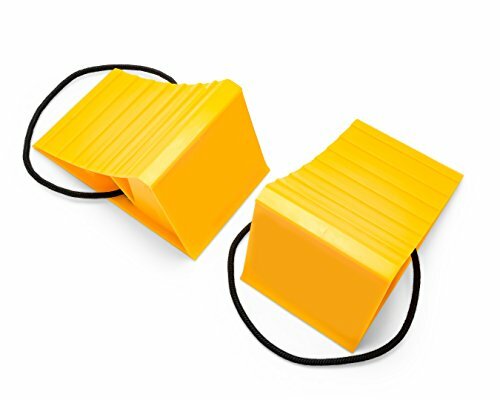 These rubber wheel chocks from YM are a great choice. The rubber on these will be more durable than the plastic on the Camco, and I like the handle on these better than the Camco’s rope because it’s solid and you won’t swing it around and hit yourself or things near you. The fact that the handle is also made out of rubber is a great feature. They come in a pack of 2, and two of these together weigh about 4 lbs less than the heavy duty Vestil model. Note that these are almost half the height of the Vestil’s but slightly taller than the Camco model. The non-slip rubber on the bottom grips the surface, and they feel very sturdy. I own these myself, and I can vouch for their durability and quality. I have left them out in rain and storm, but they look like new. They’re easy to wash off and easy to handle. They did smell a lot like rubber when I bought them, but it has gone away with time. I had plastic wheel chocks before these until they broke (Yes, the trailer rolled onto one and broke it, stupid trailer) and the same thing has happened with these, and they’re fine. Here is a solution that makes it different from the others. This wheel chock is two-in-one, and you set it up between the tandem axle. It’s also different in the way that you don’t have to kneel to set it up. You can just put it down on the ground between the tires and step down on the scissor arms until it pushes firmly against both tires. The cable makes it easy to remove it when it’s time to leave. Just grab it and slide the chock out. The ONEstep comes in two sizes. One that is made for axles between 16″ to 24″ and one that is for axles between 16″ to 30″. Both options are adjustable. Here we have wheel chocks that stick together. A 36″ nylon cord keeps them connected to each other which makes it easy when you want to leave, grab the rope and pull them out. Along the sides we’ll find reflective tape to help with visibility in the dark. These are also made out of rubber so you can count on these to last years to come. Another thing to note is that the WC24483 are lighter than every other rubber wheel chock we have looked at. ABN makes the second to heaviest wheel chocks in today’s comparison. They’re the only ones we have looked at with an eyebolt on the side of them. Put a rope on it to make it easy to carry, or maybe a chain so you can lock them to a part of the trailer. It’s all up to you. The ABN chocks come in a set of 2 and look like two big solid pieces of rubber. The weight together with its rubber bottom will provide a firm grip on most surfaces. I hope you have gotten an understanding about wheel chocks and what they can do. If you have any questions that don’t get answered in the FAQ below, let me know in comments. While all of the wheel chocks I have compared today will do a great job at stopping your trailer from rolling, I have some recommendations based on what you’re pulling. If you trailer weighs 4000 lbs or less – The Camco Wheel Chock With Rope Handle ended up getting the highest TCN score thanks to its size and weight. They’re a good choice for someone that has a single axle trailer and need something simple to keep the trailer in place. 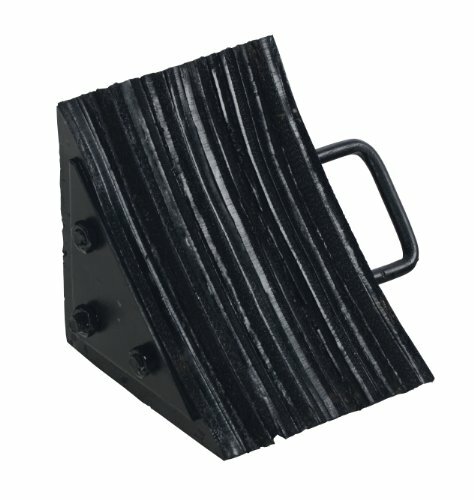 For anything heavier than 4000 lbs or any tandem axle – I recommend the YM W4194 Solid Rubber Wheel Chock with Handle. After having these for months, I can tell you that they’re great wheel chocks. Durable, great handle, great grip, and not for a bad price. I have bought two pairs so I can put two on each side. The rubber smell that bothers some never really bothered me. Does it matter if I have a single axle or tandem axle? The importance of wheel chocks is not related to whether you have a single or tandem axle. Make sure both sets of wheels have a wheel chock if you own a tandem axle. And I recommend placing wheel chocks on both sides of the trailer. It does, however, matter when picking what product need to buy. Having a single axle most likely means that your trailer doesn’t weigh more than 4000 lbs. Therefore you don’t have to get the most heavy duty wheel chock. You also can’t use a wheel chock like the Fastway ONEstep Wheel Chock For Tandem Axle Trailers since it was made for tandem axles. How to chock wheels on a trailer? Keep the trailer attached to the tow vehicle during installation, with the parking brake enabled on the vehicle. Then install wheel chocks on both sides of the trailer. This will help stop the trailer from moving when you unhitch from your tow vehicle. How many wheel chocks are required for RV? I recommend using 4 wheel chocks if you have a single or tandem axle trailer. By covering all possible directions the trailer could roll, you’ll decrease the risk of accidents and be safer. Can’t I just use a rock/piece of wood that’s all free? Think about how a rock will react if your tire starts rolling over it. Will it stay in place? Will it roll out of the way? How heavy is the rock and how big is it? It’s recommended that the wheel chock covers at least 25% of the tire height, will a rock be high enough? Driving around with rocks will also add extra weight. It’s worth it to buy a real couple of wheel chocks that were made with the intention of stopping tires from rolling. That said, a rock is better than nothing at all. What else do I need to think about when using wheel chocks? Make sure your wheel chocks aren’t damaged in any way, then it’s time to recycle them and buy new ones. The wheel chock should be fit squarely against the tire. Remove them before taking off, driving over the wheel chock is not recommended and will most likely damage it. It’s okay to leave them down while hooking up the trailer though. Finding a flat, solid surface is important so the wheel chock can do its job and work the way it was designed. So you have arrived at the campground, unhitched your trailer, put the stabilizing jacks down, firmly placed wheel chocks behind your tires, and walked into the trailer when you notice that the trailer starts to rock when you move. You are standing in a box on wheels after all. This is often a bigger problem with 5th wheels than travel trailers. You’re higher off the ground, in a most likely heavier box, so it can be more noticeable. Let’s talk about a few ways you can help reduce the rocking back and forth. BAL 25066 FastJack King Pin Stabilizer -This is a product for fifth wheels that you connect to the king pin, you know the one in front that you connect to the hitch. I have never tried this product myself but I have seen it a lot out in the wild. It adjusts from 40″ to 60″ and has large pads on its three feet to stand firm on whatever surface you put it on. This will not remove all the shaking but will reduce it when installed correctly. X-Chock Wheel Stabilizer – Here’s one that works on every trailer that has tandem axles. You put it between the tires to stop them from moving entirely. I can vouch for this product, it works as intended and it took care of almost all the shaking in the travel trailer we tested it on. With a straightforward installation and a design that lets you retract all the way down from 1 3/8 inches up to 12 inches, it’s hard to beat regarding functionality and flexibility. Note that this will not replace regular wheel chocks we discussed earlier, use both! RV Trailer Stabilizer System for 5th Wheels and Travel Trailers by Steadyfast – If you’re looking for a more permanent solution that you don’t have to set up and take down every time you want to get going, this stabilizing system from Steadyfast might be it. 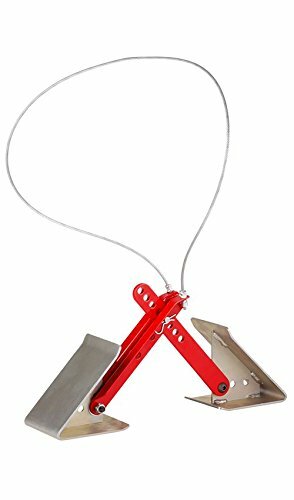 You install them by connecting the included foot plates to your existing stabilizing jacks, and then all you have to do to engage the system when you are ready to camp. This is the heavy duty solution that I believe will reduce shaking the most. I recommend this to 5th wheel owners. MOR/ryde STP32702H Fold Up 3 Step Door – One last thing I would recommend doing, not only to help stabilize the trailer but to make the trailer much more convenient to get into, is installing the MOR/ryde steps. You might have seen them installed on some new trailers at the dealership and it’s a fast-growing product. The reason it’s so much nicer than the more common steps just hanging from the trailer is that these steps sit firmly on the ground when you fold it down. They also fold up into the trailer, so you don’t have to worry about the corrosion like with steps that hang outside during travel or when you’re not using your camper. I want to be honest and tell you one negative thing with this solution, dirt and water that is on the steps when you fold it up will naturally end up in your trailer. So I advise you to sweep and wipe them off before folding them up to keep your trailer clean. These fit doors between 23.75″ and 26.25″ so before you decide to buy them, make sure to measure your trailer entrance door. To make it even more convenient, you can add a MOR/ryde handrail to make it easier to get in.